Alberta is arguably one of Canada’s most spectacular provinces. It has got both Banff and Jasper National Parks, and the surrounding ridges of the Canadian Rockies, serene Lake Louise and the glittering Columbia Icefield, great swathes of open grasslands to the north, home to bison, and in the south there are wonderfully ancient rocky deserts of Red Deer Valley and the badlands, a prime spot for dinosaur hunters. It’s difficult to say where you might find the best places to stay in Alberta, this is a vast region with so many great reasons to visit, but you will find all the best places to stay in Alberta on our Guru’s list of recommendations. Banff and Jasper National Park are two of the world’s oldest. And Banff Town exists solely as a gateway and comfort stop for exploring the park. Its got some great restaurants, boutique shops and even a nightclub, but for most people, it’s all about the spectacular mountain scenery and the opportunity to get seriously active in amongst it. The mountains and hills range high and low, crafting a dramatic course for skiers and mountain bikers, while the serene, unsullied mountain lakes are ripe for canoeing and kayaking. Jasper National Park also boasts a stunning setting and is home to wolves, mountain lions, bears, caribou and beavers. There are hot springs, incredible canyons and more of those rocky peaks. Lake Louise is another great base for enjoying the mountains, known for its teahouses, hiking and skiing. And of course, for its perfect setting, surrounded by the snow-and-glacier topped peaks of the Canadian Rockies. Just below the Rockies is Waterton Lakes National Park, a peaceful place of surprisingly flat prairies, a sparkling lake and even a surprise castle! This is a much quieter national park than Banff or Jasper, and a great place to see elk, deer, cougar and grizzly bears, as well as an amazing array of wildflowers. When it comes to the cities, Edmonton is Alberta’s capital, known for having the largest urban parkland area in North America, and for its excellent array of festivals, which culminate in the summer, but run pretty much year round. Calgary is the largest city, with a reputation among other Canadian cities for being a bit American and a bit big business. But it’s also known for holding one of Canada’s largest parties: the Calgary Stampede, an amazing produce show and rodeo exhibition - and festival and parade. And for being the gateway to Banff and the Rockies. Its also got some great museums and bars. Alberta’s rural interior is a different landscape again, this time one of wheat fields and cattle ranches. Whatever your reason for visiting, use our guide to the best places to stay in Alberta and start planning your trip. Go exploring and rappelling through the Canmore Caves - an experience that you'll never forget! Drumheller's Trekcetera features a wide variety of authentic costumes, props, and set pieces from movie and television history. Absolutely fascinating. Take in a show at Edmonton's impressive Winspear Centre. The Royal Tyrrell Museum is home to the largest collection of dinosaur bones in the world - an absolute must for science buffs! The Hotel Le Germain Calgary is right across the street from Calgary Tower; it’s a luxurious boutique hotel in the heart of town. There are 143 rooms and suites, with quite opulent decor and original artworks. It's hip and happening but with a classic, grown-up feel. 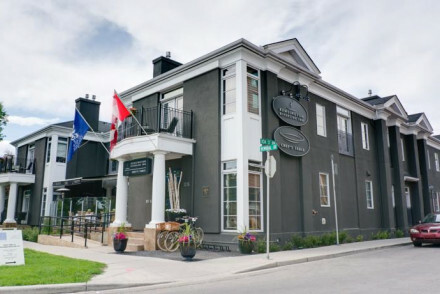 The Kensington Riverside Inn is perfect for those who like a boho vibe, as it's in Calgary’s trendy Kensington area. Rooms are comfortable and modern and you can borrow one of the complimentary bikes for some local exploring. The Juniper Hotel, located moments away from Banff at the foothills of the Rockies, offers sleek and contemporary accommodation with stunning views. Enjoy modern Canadian cuisine in the restaurant. 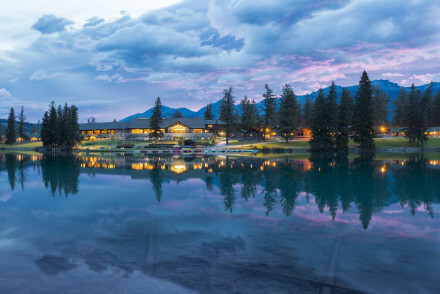 Banff’s Buffalo Mountain Lodge is the perfect place for an active break in summer or winter. There’s a range of accommodation, but most options come with fireplaces and private balconies with spectacular views. There’s an Italian restaurant, but they also have an option serving more local style cuisine. 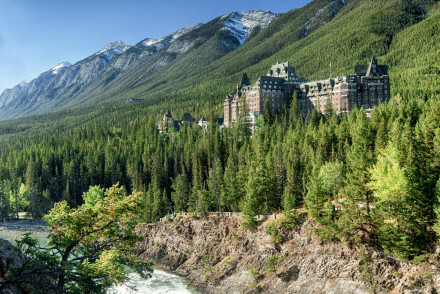 Fairmont Banff Springs is a jaw-dropping retreat. Built in the style of a Scottish castle, it enjoys an enviable mountain location and smart contemporary accommodation. Glorious. 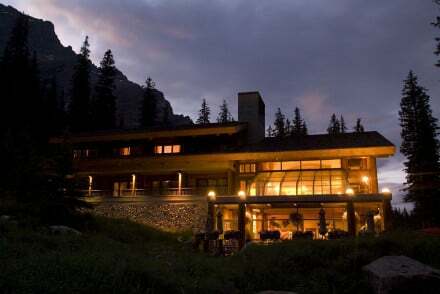 High Country Inn offers smart modern rooms, an indoor pool, spa and an in-house restaurant. All that you need for a lovely country retreat. Buffaloberry Bed and Breakfast is a charming family-run stay with hearty breakfasts and cosy rooms. If you don’t mind being further from the resort - or if you’re here to escape - then the Moraine Lake Lodge might be for you. It’s an upscale resort with 33 rustic rooms featuring handmade wooden furniture. 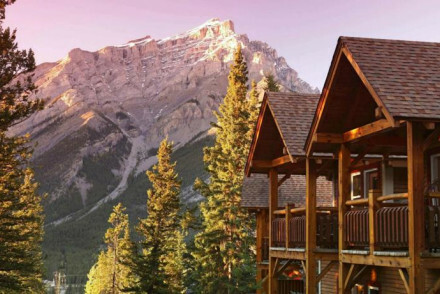 You’ll get amazing views of the Canadian Rocky Mountains and Banff National Park from your private balcony. Peaceful and serene. 2-room Ambleside Lodge, located in Canmore, is an utterly glorious stay. This rustic lodge features plenty of wooden influences and high ceilings, with huge windows boasting stunning views. Plus, the host is even a local hiking guide! 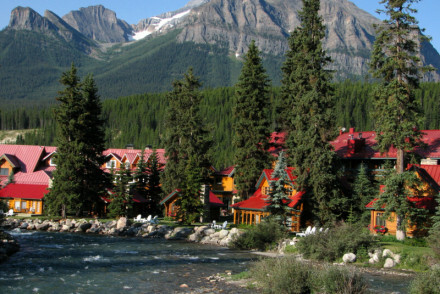 The Post Hotel & Spa is a charming hotel right by the water, and just five minutes from the Lake Louise ski resort. There are 97 simple yet elegant rooms, many with fireplaces and balconies, plus a choice of restaurants - including a Swiss fondue restaurant and an English style pub. There’s also an indoor pool. 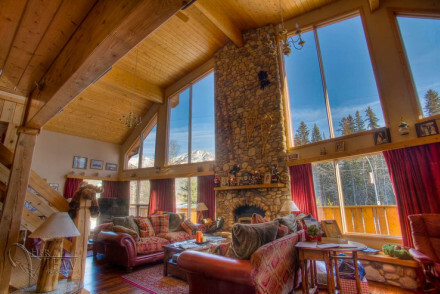 Jasper Park Lodge is a truly stunning option. Located right on the shore of Beauvert Lake, it features smart contemporary interiors, a top-notch golf course, no less than 8 restaurants and extensive spa facilities. If you're visiting Alberta to hike then consider coming in July or August, when the average temperature reaches 17°C, though if you want to go skiing then you should come between November and March. Visitors can fly into either Calgary International Airport or Edmonton International Airport. Those wanting to explore Alberta to its fullest really need to have a car. Visit Rentalcars to find out more. Browse through our list of all the best places to stay in Alberta. Expand your search to include neighbouring British Columbia. 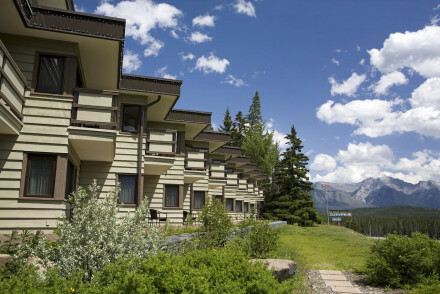 A striking hotel resting at the foothills of the Rockies, just minutes from Banff. Sleek modern interiors beautifully offset the spectacular vistas visible through the floor to ceiling windows. The on site restaurant serves modern Canadian cuisine with a local seasonal emphasis. Charming. A family run hotel in the Canadian Rockies. 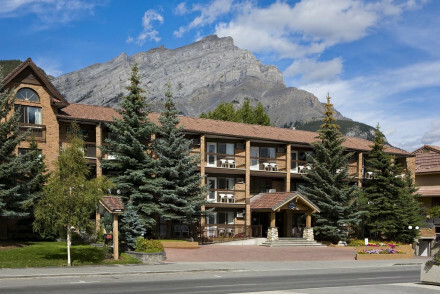 The rooms are comfortable and offer exceptional views of the mountains beyond Banff. Enjoy meals in the in house restaurant, or make the most of the amenities with hot tubs, pools and saunas. The friendly staff make this a warm and welcoming hotel. Snow or sun, this brilliant located lodge is the perfect for active families to set-up camp. Fireplaces, private balconies and comfortable beds make the rooms hard to leave but we promise the great outdoors and views are worth it. Cilantro is Italian cuisine, or try Sleeping Buffalo's local cuisine. Foodies - 40 people can be sat in the Wapiti Longhouse wine cellar on site, a great place to indulge in the local cuisine and fine wines. Romantic Break - Make the most of the enchanting and romantic views with the outdoor hot tub and private balconies. Kayaking - Leisure canoeing on Emerald Lake or Lake Louise is the perfect outing, especially with a picnic from the lodge. A charming rustic lodge in the small Rocky Mountain town of Canmore with stunning mountain scenery. Outdoor activities can be arranged in the town, such as golf, climbing and mountain biking. Host Dave Booth is a hiking guide with extensive local area knowledge to assist you in planning excursions. Bohemian Kensington district is ideal for those seeking boutique shops, independent cafes and buzzy life of Calgary. Modern rooms are the epitome of comfort, with access to tasting menus and Chef's table at the restaurant. Local exploring is on the cards, as are back to nature family activities. Local exploring - Hop on a free bicycle and explore this hip area, packed with designer stores, small unique shops, cafes, and restaurants. Sights nearby - Devonian Gardens is an indoor botanical garden home to a range of palm trees and other tropical plants. Fishing - Head to Fish Creek Provincial Park for a spot of fishing. In Jasper National Park, nestled on the shores of Beauvert Lake in the Canadian Rocky Mountains. Boasting a high-end golf course, 8 on-site restaurants, and a large spa. Ideal for active holidays or relaxed retreats in summer or winter. Attracts families and couples alike. Spa - The superb spa offers a wide range of relaxing treatments to come back to after a busy day outside. 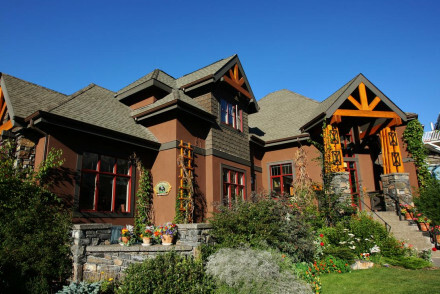 A charming family run B&B in Banff National Park. The cosy rooms have been lovingly decorated and offer fabulous views over the mountains. The breakfast is a hearty affair that will fuel you through the morning and well into the afternoon. A great spot from which to enjoy the mountains. 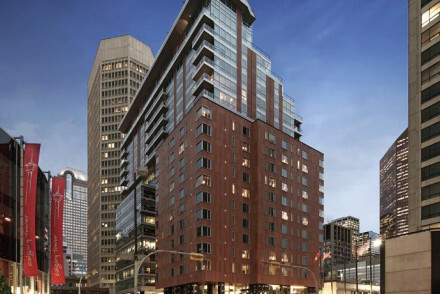 A luxury boutique hotel under the shadow of the iconic Calgary Tower. The opulent suites feature feather and down comforters, plush linens, original modern art and stylish bathrooms. The downtown location keeps your finger on Calgary's pulse. Cutting edge contemporary, with a classic feel. Sights nearby - Across the street from the iconic Calgary Tower. Styled after a Scottish Baronial Castle, this elegant retreat is situated in stunning mountain scenery, surrounded by pine trees, mountains, and lakes. Enjoy many outdoor activities from skiing to horse riding; relax after an active day in the spa, and feast on the wide selection of cuisines.